Great Family Fun at the Full-Size Water Park in Arenal Area. Get ready for some healthy fun in the thermally heated water park! 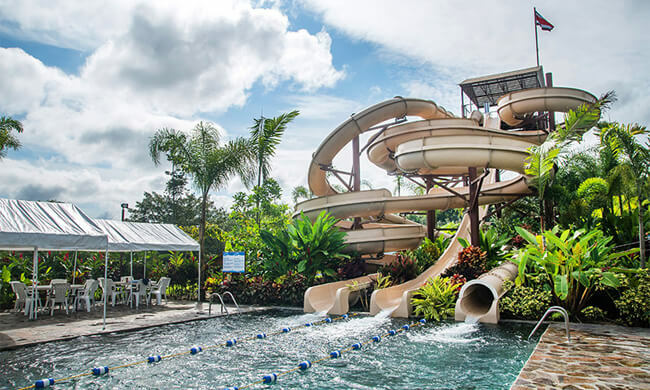 The Arenal Volcano area attraction offers an impressive, four-story-high and 370foot-long waterslide named Mammoth, and a five-story-high, three-slide monster comprised of the Cyclone, Tornado, and Avalanche. Family fun is written in big letters at Kalambu Hot Springs Water Park, make sure not to miss it! Children under six can enjoy another section of the park filled with water cannons, unsuspecting waterfall buckets, slides, and games. There are also two thermal pools, family-friendly and adult only, both featuring a swim-up bar. Mammoth is the fastest attraction in the park, with large rafts that fit up to four people! The Besa Mi Burro Restaurant offers options for both lunch and dinner. This includes Mexican dishes, Costa Rican casado, salads, and grilled options. There is also a snack bar with typical theme park food as well as fresh fruit juices, Costa Rican beer, and frozen drinks. Age limit: 7 years old, 1.2 m/4 ft for triple slide. Children 6 and under must be accompanied by an adult. Includes: Lunch or dinner (depending on the time of the entrance), transportation to/from your hotel, entrance fee with access to attractions and pools. What to bring: Swimsuit, sandals, towel, change of clothes, spending money, sunscreen.